Description In 1226, St. Francis of Assisi had a vision of a seraph (the highest order of angels) with an image of the crucified Christ amid its six wings, from which he miraculously received the stigmata - the wounds inflicted upon Christ during the Crucifixion. El Greco depicts the wounds on Francis's elegant hands, and the saint's transfixed gaze conveys the spiritual impact of the experience. The absence of setting, the brilliance of the apparition, and the elongation of the figure contribute to an other-worldly effect. This is accentuated by the white paint and loose brushstrokes, which suggest rather than define the forms and which the artist learned to exploit in Venice before settling in Spain. The ephemeral quality is magnified by the contrast of what appears to be a real piece of paper, stuck to the canvas, ephasizing the physicality of the painting as an object. It bears the words "Domenikos Theotokopoulos Made This" in the artist's native Greek, meaning something close to "[the man] dedicated to the God-bearing son made this". 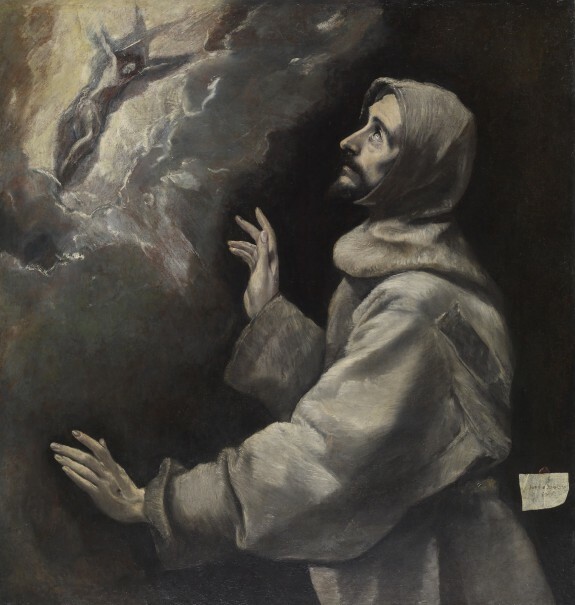 The miraculous vision was a favorite subject of El Greco's, and he, himself a lay Franciscan, created a quintessential expression of the mystical and emotional spirituality of the contemporary Counter-Reformation movement. El Greco. National Gallery of Art, Washington. 2014-2015. Provenance Don Marcello Massarenti Collection, Rome [no. 351]; Henry Walters, Baltimore, 1902, by purchase; Walters Art Museum, 1931, by bequest.